Neo Series, only from Iwata. The Neo for Iwata Trigger Airbrushes make getting started in airbrushing easier than ever. Its innovative dual-action pistol trigger design offers simple, ergonomic operation and the pre-set handle allows even the beginner to pre-set the spray performance for any line, any background, any shade, perfectly every time. This is not any ordinary trigger airbrush. The Neo Series, including these Neo for Iwata Pistol Trigger Airbrushes, are unique in that they are designed to work at low air pressures. The benefits of the Neo Pistol Trigger Airbrushes working with low air pressures are minimal overspray, precise control, detailed spraying, fine atomisation and affordability. Specifically designed to work together, the Neo-Air for Iwata Miniature Air Compressor and the Neo for Iwata Pistol Trigger Airbrushes make the perfect set... affordable and compact. Iwata-Medea back Neo Series airbrushes with their usual 5 year warranty. 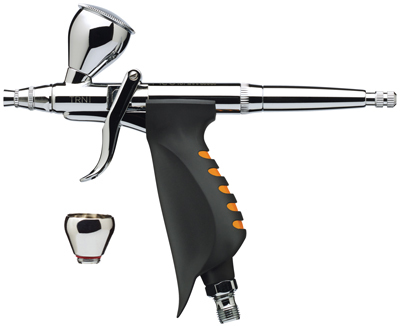 The Neo for Iwata TRN1 gravity feed pistol trigger airbrush is preferred when working in small to medium sized areas with small amounts of paint. Gravity feed airbrushes perform well at lower air pressures, which help create greater detail. The interchangeable gravity feed cups offer paint capacity options. The larger size offers easy in-cup paint mixing. The medium size makes it easy to see over and good to view the working surface. The no-cup option is great for quick touch-ups when only a tiny amount of paint is needed. The Neo Series airbrushes are much better quality than the cheap copies of Iwata airbrushes that are available on the market, and are suitable for beginners to professionals for all applications. However, for the absolute best performance and control, please consider stepping up to an Iwata professional airbrush, starting with the Iwata Revolution series. Click here for a feature comparison of all Iwata airbrushes. Click here view other models of Iwata airbrush suitable for these applications. Interchangeable large 9ml (1/3oz) and medium 1.8ml (1/16oz) cups designed with a funnel shape, which makes for easy clean up and more efficient paint flow. (Both cups are included with airbrush). Air Pressure: Recommended operation is between 5 and 35 psi. Ideal for use with smaller air compressors.